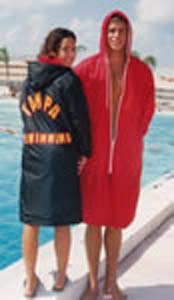 SWIM PARKAS - BIG SALE WHILE THEY LAST!!!!! SWIM ZONE CUSTOM MADE PARKAS have warm thick pile lining throughout the coat, hood and deep pockets. The outer is totally waterproof with elastic cuffs and the length is extra long for keeping legs covered. NIKE PARKAS are also available. They have a water resistant outer with a polar fleece silver gray lining along with deel pockets.
. This polar fleece lined parka has a hood lined with the polar fleece as well a ipped pockets lined in the polar fleece also. It is vented on both chest and back for easy lettering. There is a deep inner breast pocket and the outer fabric is water resistant. This parka is truly the best on the market..